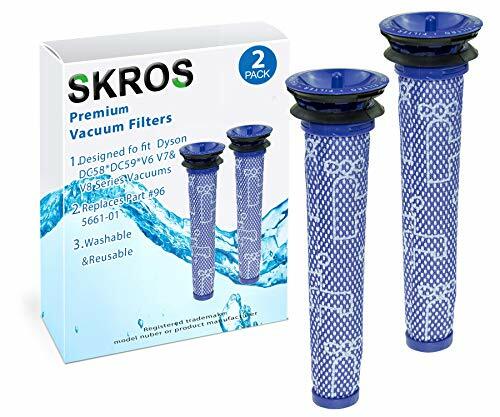 Pre Filter Replacement Compatible with V6, V7, V8, DC58, DC59, DC61, DC62 and DC74, replacement part of # 965661-01. Be effective to prolong the life of your Dyson Vacuum Cleaner. Note: It's better to wash the Dyson filter 2-3 months regularly, and install it after air dry. This Dyson replacement pre-filter should be replaced when it can't be washed clean. Recommended replacing every 5-8 months. let the Dyson filter replacement part air dry itself, don't bake it to avoid deformation. If you have any questions about this product by SKROS, contact us by completing and submitting the form below. If you are looking for a specif part number, please include it with your message.